Do hybrid cars sacrifice speed for better fuel-efficiency? AutoGearhead: In this article, John Fuller has explaination, are hybrid cars slower than regular cars? Part of America's love affair with cars is the desire for speed. Sure, we're attached to automobiles for several other reasons they get us comfortably from one point to the next, and we're even willing to sit through grueling traffic jams in them just to get to work or to the grocery store. But the rumble of the engine, the whine of the gears shifting upwards and the wind flowing through an open window is a common, iconic image. It's probably no coincidence that lots of American road movies include montages that attempt to convey that sort of feeling. The rising popularity of hybrid cars within the auto industry, however, is changing that familiar perception. For one, most fuel-efficient vehicles don't necessarily rumble. In fact, most employ a function that allows the gasoline engine to stop running while sitting in traffic, coasting or even when the car is driving at lower speeds. Instead, a hybrid vehicle uses a quieter electric motor to conserve fuel and produce fewer emissions. But despite being known for having good fuel efficiency and promoting eco-friendly driving, some have criticized hybrid vehicles for a variety of reasons. Some have questioned, for instance, the reliability of hybrid battery packs, claiming that they tend to be faulty and that they're expensive to replace. This is largely untrue, and nearly every car company producing a hybrid vehicle guarantees their battery pack for the life of the car. Other critics, at least those that have grown accustomed to faster speeds associated with modern gasoline-powered cars, have noted that hybrid cars are typically slower than regular automobiles. The claim is that by focusing on fuel-efficiency and lower emissions, hybrid cars are sacrificing higher speeds and more power, slowing down their performance. Because this doesn't gel with the typical image of the fast American car, some drivers are a little turned off by this. So, are hybrid cars really slower than regular cars? Why is this? And is that really the point for someone concerned about green driving? it's good acceleration that some models lack. When most people buy a hybrid car, they usually do so with the understanding that there's going to be some kind of compromise between power and eco-friendly driving. The reason hybrid vehicles have become such a buzz topic and a go-to model for the auto industry recently is because of that compromise. As concerns increase over global warming, caused in part by carbon emissions resulting from vehicle fuel consumption, the power provided by a gasoline engine coupled with the fuel-saving qualities of an electric motor seem like the best possible combination. But are fuel-efficient vehicles significantly slower than regular cars? To see if hybrid cars crawl on the road rather than zip along, we have to look into hybrid engine performance. 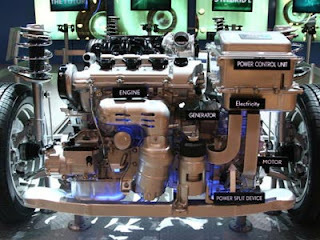 Generally speaking, the engine in a hybrid car is almost always smaller than the engine in a comparable non-hybrid car. Smaller engines usually equal less horsepower and less torque. To get good fuel efficiency, hybrids operate from a standing start using only the electric motor, which typically provides much less horsepower and torque than a gasoline-powered engine. These two systems work together, however, to ensure hybrids can save fuel in the city and drive at faster speeds on the highway or even climb steep hills. 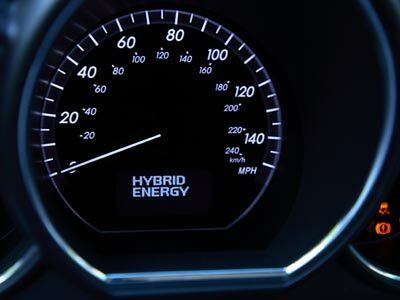 In short, hybrid cars won't be maxing out at 45 miles per hour (72 kilometers per hour) on the highway, endangering -- or at the very least, angering other drivers on the road, but they won't go quite as fast as most regular cars, either. While many all-electric vehicles have significantly lower top speeds and some are even a little bit unstable on the highway, hybrid cars get enough power from the gasoline engine to go as fast as 100 miles per hour (161 kilometers per hour). The real matter for hybrids is in acceleration. Since the smaller electric motors that most automakers use don't produce much horsepower, a relatively fast hybrid car can go from zero to 60 miles per hour (97 kilometers per hour) in about six seconds, while a more typical hybrid car's zero to 60 time hovers around the 10 second mark. For some people, that's a little too slow. This video below, will describe about a Blue TEC hybrid features, an additional magneto-electric motor and a 7G-TRONIC seven-speed automatic transmission specially configured for the hybrid module, the necessary operating and control electronics, the transformer and a high-voltage lithium-ion battery. During braking the electric motor acts as a generator and is able to recover kinetic energy by a process known as recuperation. During this process the electric motor works together seamlessly with the engine brake of the internal combustion engine and the conventional wheel brakes. The recuperated energy is stored by a compact but efficient lithium-ion battery in the engine compartment and retrieved when required. Major advantages over conventional nickel/metal hydride batteries include a higher energy density and greater electrical efficiency combined with more compact dimensions and a low battery weight. Thanks to space-saving installation in the engine compartment, the trunk capacity and generous interior dimensions remain unchanged. The hybrid module also has a convenient start-stop function. This is definitely a never ending debate whether hybrid cars are better than normal cars or not. We should only go for practical test to checkout the possibilities or should follow certain instructions made by experts. According to reports hybrid cars are completely depending upon the performance rechargeable batteries and normal fuel vehicles are depending upon their engine and horse power. The performance of the hybrid car is quite slower than the normal car. It was proved that hybrid cars are definitely little slower, so hybrid car owners are facing multiple problems with their vehicles. I really appreciate this article and the instruction present here regarding the performance issues of hybrid cars. Thanks for such a wonderful post. Thank you so much! This is the answer I need.